“Agent Carter” and “The Family” have both been canceled by ABC, TheWrap has learned. “The Family” had only been on the air for one season. “Agent Carter” had aired for two seasons. Both shows failed to find a significant audience. “The Family” scored only a 1.5 rating in the key demo and 5.7 million viewers when it premiered in March. It is currently only averaging 3.3 million viewers per episode and a 0.8 rating in the key demo. “Agent Carter” is faring no better. It is only averaging 2.7 million viewers and a 0.8 rating. Atwell originated the Peggy Carter role in “Captain America: The First Avenger” and has since played it in four Marvel movies total, including the latest, “Ant-Man.” She also appeared in Kenneth Branagh‘s “Cinderella” and indie “A Testament of Youth” with Alicia Vikander. She is represented by CAA. Atwell won’t be out of work long, however. Her new pilot, “Conviction,” was ordered to series earlier today. The series tells the story of Carter Morrison (Atwell), the brilliant but ne’er-do-well daughter of a former president, who is blackmailed into taking a job as the head of Los Angeles’ newly created Conviction Integrity Unit. She and her team of lawyers, investigators and forensic experts work together to examine cases where there’s credible suspicion that the wrong person may have been convicted of a crime. Network executives are pondering which TV pilots to pick for their fall schedules. Here are some shows most likely to get a nod. Candice Bergen was the star of the classic sitcom "Murphy Brown." Now she's back in ABC's "Pearl," about a strong-willed matriarch battling cancer as well as her family members. Fox is going to try a reboot of "The Exorcist," the 1970s horror classic about demonic possession, this time with Oscar winner Geena Davis in the starring role. And speaking of retreads, Fox is also hot on doing a TV series adaptation of "Lethal Weapon," the buddy-cop franchise that starred Mel Gibson and Danny Glover. "Designated Survivor" is ABC's political drama with Kiefer Sutherland tapped as President after a terrorist act kills his predecessor. The show was ordered straight-to-series, so we will definitely see it. "Parenthood" writer-producer Jason Katims is behind "Bunker Hill," a new CBS medical drama about a cutting-edge hospital and the mysterious tech titan behind it. Producer Greg Berlanti ("Supergirl") has another CW show that's getting buzz: "Riverdale," which is kind of like the Archie comics as reimagined by David Lynch. If you like NBC's "The Blacklist" with James Spader, you might also like the planned spinoff with Famke Janssen. 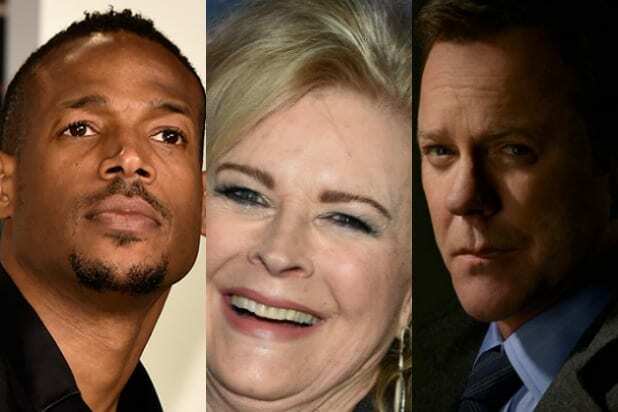 NBC is also likely to pick up "Marlon," a family sitcom loosely based on the life of Marlon Wayans. And then there's Kevin James, who broke through with CBS' "King of Queens." Now he's back with another CBS sitcom that already has a 13-episode order.